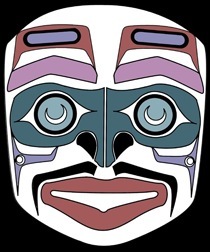 Origin: Pacific Northwest, Tlingit. 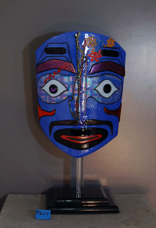 Most Tlingit masks are human-like. The ceremonies performed by the tribes from this region were based on the religious belief in personal encounters with supernatural beings. The Shaman received their power from encounters with the supernatural who disguised themselves in animal guise. The Shaman spirits were said to return to the family of a dead Shaman, but each Shaman had to seek the power for himself after getting the call.